According to the U.S. Bureau of Labor Statistics (BLS), mechanical engineers hold over 222,000 jobs, more than half of which are in manufacturing: machinery, transportation equipment, computer and electronic products, and fabricated metal products manufacturing industries. The BLS predicts an increase of nearly 10,000 mechanical engineering jobs by 2016. The median annual salary for a mechanical engineer is slightly over $75,000, according to the U.S. Bureau of Labor Statistics in 2007. Starting salaries average about $50,000+ per year, and top-tier engineers can earn over $100,000 annually. Remember, these are just estimates. Your salary will depend on a number of factors as well as the current state of the economy. Practically every company that designs and produces a product employs a mechanical engineer. But mechanical engineers can also be found in research labs, the military, government, and in other professions such as medicine, law or teaching. Most mechanical engineering jobs require design experience. When a need comes about for a new or improved product, companies call upon mechanical engineers to do the job. Engineers have to push beyond the limits of their previous work and use innovative technology to meet project requirements successfully. A second major area of employment for mechanical engineers is manufacturing. Manufacturing jobs cover nearly everything involved in developing a product, from selecting the appropriate materials to choosing the correct machinery to manufacture the product. Most mechanical engineers in this industry work for equipment manufacturers, aerospace companies, utilities, material processing plants, transportation companies, and petroleum companies. They also work with small firms, consulting practices, universities, and government research labs. Biomedical engineer: Mechanical engineers work with a variety of medical professionals to design mobility aids, prosthetics, and artificial organs. Consulting: Once mechanical engineers have gained significant on-the-job experience and developed a high level of expertise, they might choose to work for themselves as consultants or independent contractors. Here they can work on projects of their choosing for clients they respect. The consulting field offers opportunities in large and small engineering service firms and in private practice. Heating, ventilation, and air conditioning (HVAC) engineer: In this field, engineers design refrigeration systems for making frozen foods, or air-conditioning and heating systems for businesses and industrial buildings, residential homes, autos, hospitals, and schools. 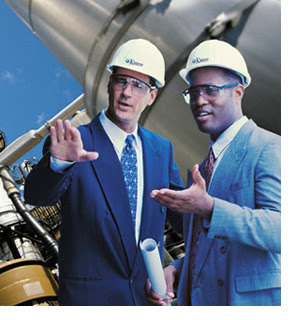 Nuclear engineer: The design of nuclear power plants requires the services of a mechanical engineer. The engineer must understand the fundamentals of nuclear design, know how to operate the plant efficiently, and evaluate the environmental factors associated with nuclear plants. Robotics engineer: A mechanical engineer may design machines that build other machines. For instance, a robotics engineer may be involved with creating the devices that are used in assembling automobiles. Engineers are concerned with the robot's structure, its joint mechanisms, bearings, and heat transfer characteristics. Teaching: A desire to help mold the next generation of engineers motivates some mechanical engineers to move into academic careers. Engineers in colleges oversee research activities, manage laboratories, and mentor students. They also write and publish books and technical papers about mechanical engineering. The government agencies that typically hire mechanical engineers include the U.S. Navy, Patent and Trademark Office, International Trade Commission, Army Corps of Engineers, Department of Energy and even the U.S. Postal Service. From developing toys to prosthetic legs, the types of projects you can be a part of are as vast as your imagination. With a degree in mechanical engineering, diversity is the key. You can wind up working in a laboratory or an outdoor construction site. Remember, nearly every mechanical device was created by a mechanical engineer so the possibilities for employment are virtually endless!